Speaking from the monitoring post of Gunung Agung in Rendang, Pak Devy Kamil Syahbana gave this highly informative interview on Oct 14th, two days ago. The english translation isn't perfect here but you get the idea. RIO HELMI (interviewer): You said that yesterday there was a non-harmonic tremor for the first time since the status of Beware. In the past, the existence of non-harmonic tremors has been the reason that the status is raised from alert to alert. DEVY KAMIL SYAHBANA: Yes, that time was once. Then including yesterday there have been a total of 9 times. From the last two days there are eight times. (since this interview has been done 3 times more). RH: Was there any sign of improvement or how? DKS: Non-harmonic tremors are volcanic earthquakes that appear in sequence. So an earthquake emerged, before this quake appeared other earthquakes had emerged. Physically it is the process of fluid streams breaking through the gaps, which sound like "deck-deck-deck". If an earthquake was his voice "deck" so. Yesterday before it appeared we recorded 900 volcanic earthquakes which means there is a significant increase in pressure. Because of the excessive pressure that he must be streamed, and when drained it appears such tremor. But the manifestation on the surface is not necessarily in the form of an eruption. Indeed in the world there are instances where "spasmodic burst" (it's another name) appears before the eruption, but there is also a spasmodic burst where the manifestation on the surface is not an eruption. For example there is a thicker smoke. Yesterday for example after spasmodic burst manifestation on the new surface of smoke is thicker only. RH: So anyone tells you that the eruption is a spasmodic burst that does not stop there? DKS: Oh no. The name of tremor in the volcano there are three. The first is the deep tremor and high frequency content, he is still in the stages of destruction of the cracks to rise to the surface. Well after that it usually appears that is called harmonic tremor. Well when the harmonic tremor appears it means magma is already hundreds of meters, is approaching the surface. But this does not always appear, depending on the nature of the mountain. After this harmonic tremor comes a new continuous thermistor. As this continuous tremor appears he breaks the lava plug (lava plug). After 1963 the remains form a lava plug, it is a magma that in the long period of time occurs crystallization, which serves as a stopper. It's like a coca-cola bottle when it's shaken up the gas. So the gas is hot, and therefore he is able to pour into the crater, When normal conditions do not smoke out. In July, August yesterday he (G Agung) did not smoke, unlike other mountains 'open system' where he was open so the smoke came out. Mount Agung is a closed system closed yesterday out this smoke due to the manifestation of the increase of the pressure inside. RH: Oh so the smoke is no longer just water that hit the hot crater? DKS: If there is only water vapor there will be no smoke, if there is smoke, it means steam from magma, like that of October 7th as high as 1500 meters. That 'magma heating' is really true. That high pressure (high pressure) it is called 'volcanic puff'. 'Puff' that happens when the pressure is partly out but not out of material, new organic gas. RH: Well if the continuous tremor is said to be a symptom will soon erupt, Are there other symptoms that can socialize to the community. DKS: If monitored in tremor device continuously and also the power increases until finally 'overscale' (exceeds the capacity of recorder). DKS: It could be baseball looks first. If it feels it could be when it's really energinya very strong. But if the energy is not strong we can not know its manifestation. There are so many volcanoes that look calm suddenly erupsi.Gak must smoke it out first before it erupts. RH: So for ordinary people, in KRB for example, what signs should they pay attention to? DKS: Yes usually the KRB will hear the voice first. If there is a voice that has begun to erupt. If you still may have to run as far as possible. Because it can start at a smaller eruption, it just opens, then can be followed by a bigger eruption high. 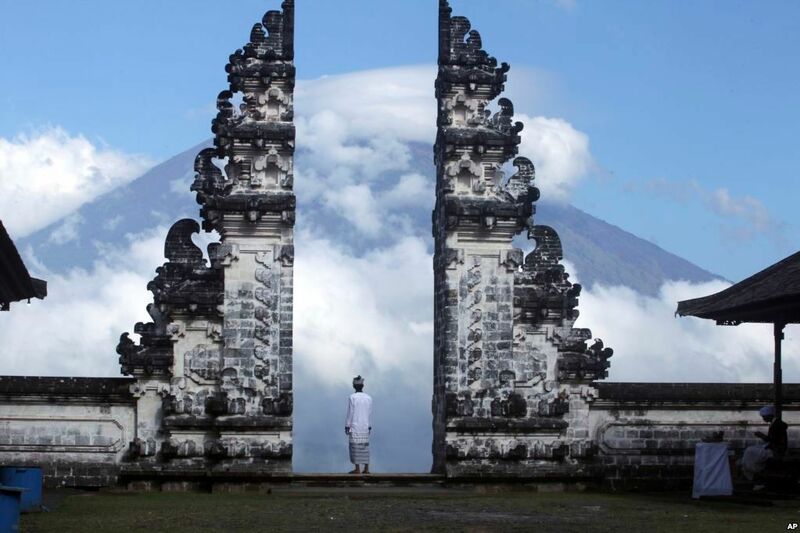 If it used to be Gunung Agung like that, but we can not predict whether it will be exactly like that. In 1963 there was no instrument, (only outside observation). But we can not predict exactly before; such as in America (Mount St. Helens) is predicted as it used to be different. So we better be careful to predict until someone feels in a safe area before the disaster. If the signs, I never experienced being in Krakatau when erupting, before there was a sound like rocks pitted-fighting 'krak-krak' so and if we are on a rocking mountain. Yes if it still had time to run - the stone will be thrown everywhere and fell at high speed, hundreds of meters per second. (Only) if the profit (once) can be saved. 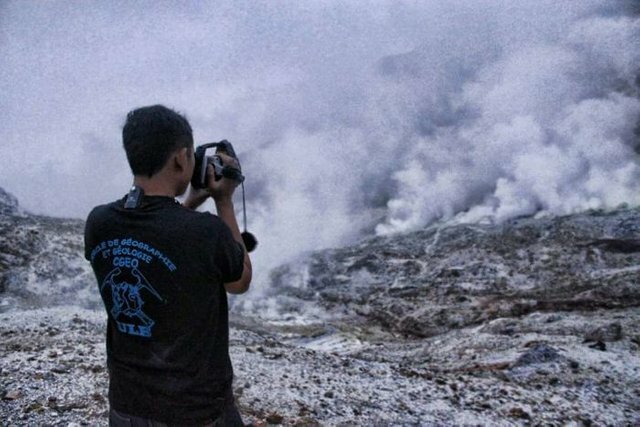 Vulcanologist Dr Syahbana (pictured here on an alternative expedition) says it is impossible to predict the size of the eruption. We will have some recent photos to post from this account soon, showing clearly what is happening.